We live in a time where we have many options for many things, and have the luxury of being selective. Whether that is where you order pizza from, who you have fix your roof, or even which surgeon you use, it’s all in your hands. When it comes to podiatry, there is more than one option, and it is important you feel comfortable with their work before undergoing any surgery. Here are some tips on how to decide on the right foot surgeon for you specifically. If you are looking for a knowledgeable staff to help make your decision easier, contact Jamfeet to learn about what Dr. Jamshidinia can do for you, as well as cosmetic foot surgery before and after photos we can show you. The most important step should be the first step in your search: is the surgeon in question a qualified expert with enough experience to perform the procedure you are looking for? If you can answer yes to this question, than that surgeon can move onto the next round. Jamfeet is experienced in many areas of foot and ankle trouble, and have come across many different cases for every type of ailment. Anything from bunions, wart treatment, fractures, heel pain, flat foot surgeries, and more are part of their wheelhouse. Jamfeet is home to top-rated podiatrist, Dr. Jamshidinia who is exactly who you want as your foot surgeon. Although availability and cost should be an important factor, it should not take the forefront because the cheapest surgeon is not worth using if they are not experienced or qualified. The old adage of “you get what you pay for” always proves to be true, so do not expect to hire a ten dollar surgeon to do a thousand dollar job. Availability means more than just the surgeon’s schedule, but also their ability to pass on discounts to you, and if they are part of your insurance network. Be sure to schedule a consultation with any prospective surgeons you are hoping to use to discuss what payment plan options they provide, as well as what services specifically cost with any additional fees. Getting the bottom line and finding out as much information as you can beforehand will allow you to make a more informed decision. Any type of surgery is a stressful and intensive process; even the most noninvasive procedures have some amount of anxiety and fear associated with them. It is important to feel comfortable with the surgeon that you pick to help mitigate as much of the anxiety as possible. Not only is this a physical procedure that might come with pain, but it is a financial commitment as well, so make sure your money is going to someone who will give you your biggest return on investment. Be sure to do a consultation with every prospective surgeon on your list after narrowing down who is the most qualified and can work with you financially. Get a feel for the surgeon’s personality and their bedside manner because this is the person you will be working closely with throughout the process. Also, make sure that the staff is kind and helpful because they are the buffer between you and the doctor for appointments and questions. Finally, make sure that you are not uncomfortable with the facilities that will be used for your appointments and procedure. Feeling confident in your decision will make all the difference throughout the process. Jamfeet has many success stories that prove they are one of the top qualified podiatrists you can find. With many cosmetic foot surgery before and after photos, you can see these success stories with ease and feel comfortable making the decision to use them as your next foot surgeon. Contact Jamfeet today to make an appointment! Diabetes is a disease that affects 25 million Americans every year. While most Americans are aware of the debilitating effects of diabetes and may know someone personally who suffers from this illness, few know of the dangers of diabetes and its effect on your feet. Often referred to as Diabetic Foot, this dangerous diagnosis can lead to life-threatening complications and should be treated with the upmost importance. For more information on causes, symptoms, complications, treatments, and procedures from the best podiatrist in Los Angeles, contact the experts at Jamfeet. It is not uncommon for those with Diabetes to experience significant nerve damage, which can cause complications with balance, strength of surrounding muscles, and the shape of your foot from inconsistent and shifting weight placement. However, nerve damage can also show its symptoms through the skin on your foot changing to a dry texture. Since the nerves control the oil and moisture in your skin, damage to the nerves will render them ineffective and cause the surrounding skin to peel, crack, and even bleed. It is important to be aware of any changes in your physiological makeup to help prevent any further damage from happening. Another danger of Diabetic Foot is significant numbness and loss of sensation in the toes and feet, which professionals call Diabetic neuropathy or, more specifically, peripheral neuropathy. This numbness can cause fresh wounds, ingrown nails, small cuts, and other injuries to fly under the radar, later resulting in infection to the untreated area. If this infection goes untreated, it can result in anything from a minor treatment to a necessary amputation. Being aware of this symptom is important to prevent any secondary damage to your body that is unnecessary. Aside from Diabetes interfering with the body’s ability to produce insulin on its own, it also impairs the body’s ability to maintain steady and continuous blood flow throughout the entire body. When heighted sugar levels cause the blood to accumulate instead, the constant circulation of blood is hindered, which results in the inability of white blood cells to rush to new lesions or sores and heal the area naturally. To find out more about how lack of blood flow can hinder your body’s ability to function properly, read here for more information from the experts. The greatest treatment for any disease, including Diabetes, is to attempt to prevent it before it becomes a problem. With 80 million Americans considered “pre-diabetic” and another 7 million who are undiagnosed, it is important in both the prevention and treatment of Diabetic Foot to schedule regular check ups and appointments with an experienced podiatrist. With five-star reviews across Yelp and RateMDs, the team at Jamfeet have made a name for themselves being the best podiatrists in Los Angeles. Their state of the art facility, years of experience, and unparalleled passion make it an enjoyable experience for their patients. Contact us today to schedule your consultation. At Jamfeet, we have some of the most highly experienced podiatrists in the greater Los Angeles Area. We oversee patients suffering from a range of foot and ankle conditions, and are trained in a variety of areas, including foot and ankle treatments and podiatric surgery. We’re here to make sure you are safe, comfortable, and well cared for. For more information on the top foot surgeon in Los Angeles, schedule a consultation today. We’ve helped hundreds of clients with foot ailments from ingrown toenails to tendon surgery, and we can help you, too. Call to set up a consultation so we can determine your personalized treatment plan and have your feet looking and feeling their best. But, first, you might be wondering what our range of services is. We have wide range of services; read below to see if one of them might be the answer to your problem. The most common symptoms of bunions are a bump on the foot at the base of the big toe with swelling or soreness around the joint. You might noticed thickened skin at the base of the big toe, corns, calluses, foot pain, and limited movement of the toe. If you are suffering foot pain due to bunions, our team provides bunion surgery with quick recovery time, with patients being able to walk the same day. Dr. Jamfeet is the trusted provider of Bunion Surgery in Los Angeles, even specializing in revision bunion surgery to correct previously failed bunionectomies. Tailor’s Bunions, commonly referred to as a bunionette, is a bony growth on the little toe of the foot, and can cause pain, swelling, cysts, calluses, ulcers, and numbness. These can cause mild to throbbing discomfort around the joints of the little toes. Most patients respond well to the non-surgical treatments to Tailor’s Bunions, and in the rare case that a patient needs a bunionectomy, our trained surgeons are extremely skilled and experienced in this procedure. Commonly caused by wearing shoes that are too small or too tight, hammertoe is a fairly common foot issue for which there are several treatment options. From trimming corns and calluses to medications, our experienced doctors will create a custom hammertoe treatment plan right for your individual condition. Lots of people are looking to minimally invasive surgical procedures to make sure their feet look great in sandals and feel great in their favorite shoes. If you don’t like the way your feet look or feel, contact us today! If you develop a stiff big toe joint, it can impede your ability to walk, making each step painful. This issue can get progressively worse over time, so if you’re facing it, come to us. We have a range of treatments, including cortisone injections, a minor surgery to correct joint stiffness, and in extreme cases, joint fusion. If you are a woman, overweight, have a job that requires lots of walking or standing on hard surfaces, are a runner, have tight calf muscles, or have flat feet, you are a candidate for plantar fasciitis. We have both surgical and nonsurgical treatments for this ailment, so set up a consultation so we can see which is right for you. Symptoms of plantar warts range from lesions or growths on the soles of your feet to small black spots to pain when you press on the soles of your feet. You’ll often find these on your heels or balls of your feet, but because they can be spread through skin-to-skin contact, they can appear elsewhere. The earlier you treat these, the better! Although there is, unfortunately, no cure for rheumatoid arthritis, there are many methods of treatment to reduce inflammation and control pain. Our team of experienced professionals will evaluate and prescribe the best personalized treatment plan that revolves solely around your specific issue, starting with nonsurgical solutions until they are exhausted. Ingrown toenails may not seem serious, but they can lead to issues like bacterial and fungal infection, cellulitis, and scarring of the nail fold and the surrounding skin. You can treat them at home by soaking your feet in warm water and applying antibiotic scream, but if that doesn’t work, come visit us and get your ingrown toenail treated the same day! Toenail fungus is incredibly common in the US and there are a variety of treatments available. Treatments include over the counter antifungal medications, prescription medicines, natural at-home remedies like tea tree oil, and filing off white marks. If these don’t work, our laser treatment vaporizes the fungus embedded in your nail bed and affects only the cells responsible for the infection. The only treatment that will completely get rid of a foot lipoma is a Foot Lipoma Excision, or foot tumor removal. We inject the area with a local anesthetic, and the recovery time depends on the person and the size of the lipoma, but patients should be able to return home after the excision with minor stitches. This surgery can remove hardened fibrous tissue and repair small tendon tears that come as a result of repetitive injuries. If your Achilles tendon has ruptured or torn, this surgery can reattach the ends of a torn tendon, which is a more definitive solution than nonsurgical treatment and minimizes the chance of re-rupturing the Achilles tendon. It’s best to get this procedure performed as soon after the rupture as possible, and recovery can take up to 12 months to regain full strength and range of motion. Tendon injuries in the foot and ankle are very common, and often times go untreated. It is important to seek medical attention anytime a tendon injury occurs in order to avoid the development of a painful, possibly chronic issue. If you’ve suffered a tendon injury and are looking for the best long-term solution, a tendon surgery might be what you are looking for. Set up a consultation so we can determine your best treatment plan. The treatment of a foot or ankle depends on the location of the injury and how severe it is. Fractures can heal on their own, but without proper treatment, they might not heal correctly. Treatments range, from ice and rest to surgery, so setting up a consultation to determine your treatment plan is very important. Extracorporeal Shock Wave Therapy is a noninvasive surgical procedure that uses sound waves to stimulate healing in some physical disorders. You might be a candidate for ESWT it you have Plantar fasciitis or heel pain that has not been resolved with other treatments. The recovery from this is easy. Being flat footed is a common condition that occurs when tendons that support the arch collapse or are underdeveloped. Though usually painless, it can make actions like standing, walking and running for long periods of time very painful. 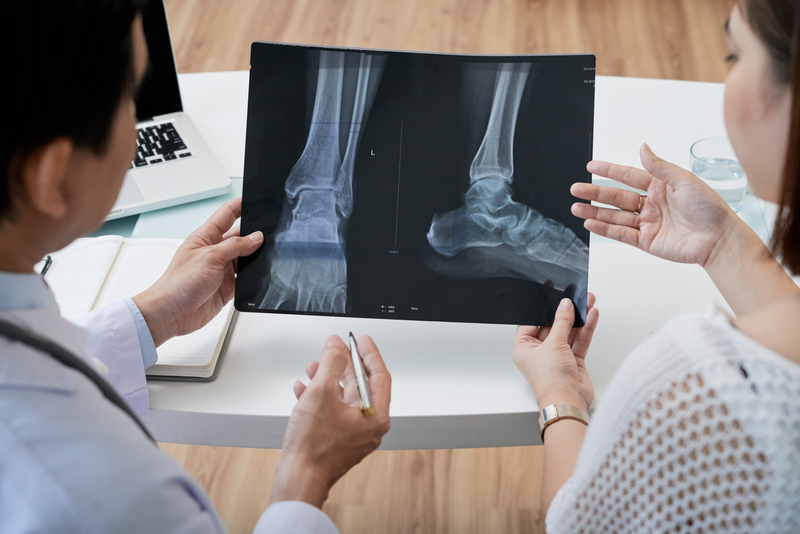 Our doctors can recommend the best course of action to best treat your particular case of flat feet, which ranges from from shoe inserts to custom orthotics to surgery. The point of custom orthotics is to correct movements that cause your foot pain and can protect your foot in areas that are painful or sore. There is a large range of custom orthotics, and they are made special to you and your particular issue. A neuroma is a growth, or tumor, of a pinched nerve. This is a painful condition that can lead to burning pain in your foot and toes and even numbness and tingling. Something to remember? Foot pain is not normal! The treatments for neuromas range from medication to surgery, and your particular treatment plan will depend on your particular case. Diabetes can cause life-threatening complications to your feet because of an accumulation of blood sugar causing downstream effects to your nerves and blood vessels. Symptoms include tingling, numbness, loss of sensation in your feet, decreased blood flow to your feet, and many others. Podiatrists can help patients avoid major complications. If you are an athlete, dancer, have flat feet, love high heels, have hammer toe or diabetes, you might benefit from fat pad augmentation. Overtime, the fat pat on the bottom of your feet loses thickness and resilience which can cause pain at the balls of your feet and discomfort while walking barefoot or in shoes. If you’re experiencing these symptoms, it’s time to consider fat pad augmentation. Great toe arthritis is a common problem that often leads to severe pain and limited everyday functionality. Modern joint replacement implants are proven to withstand extreme force and can provide patients with a totally new quality of life. Athlete’s Foot symptoms range from dry skin to itching and burning to inflammation. If you think you have Athlete’s Foot, come in for a consultation where one of our doctors might take samples of the fungi from your skin to determine your diagnosis. Often times, the treatment plan is an oral or topical medication. If you think you are a candidate for a foot procedure, please contact the top foot surgeon in Los Angeles to set up a consultation! Why do Some People Have Flat Feet? Most people have a gap underneath their feet while standing. Their arch, the inner part of the foot, will be slightly raised off the ground, but those with flat feet or fallen arches have very low or nonexistent arches. The question on everyone’s mind, though, is why do some people have flat feet to begin with? Read on to explore some of the reasons why a person may have low arches or flat feet. For a consultation with the top podiatrist in Los Angeles, contact Dr. Jamshidinia today. First, let’s examine what flat feet are. Someone with fallen arches may have one or both feet sitting flat on the ground. Their shoes might fit and sit unevenly or wear down more quickly on one side. While there are no symptoms, some people with fallen arches or flat feet may experience foot pain or back pain, depending on the severity. Some may have an uneven distribution of body weight which causes fallen arches or flat feet. The most common symptom of flat feet is foot pain because connecting ligaments and muscles may be strained. Other pain symptoms may occur in the form of swelling in the arch area, back or hips, calf or knee, or general lower legs. Over 26 bones are held together by over 100 muscles, tendons, and ligaments as well as 33 joints inside one human foot. Foot arches give support to distribute body weight evenly across legs and feet while also giving spring to your steps. Structure of your foot arch will determine how you walk. Arches must be both flexible and durable in order to adapt to various levels of stress and walking surfaces. Some causes of flat feet may include genetic family history of flat feet, foot or ankle injuries, weak arches, arthritis, or rheumatoid arthritis. Other causes might be the damage, dysfunction, or rupture of the posterior tibial tendon. Some nervous system or muscular diseases such as muscular dystrophy, cerebral palsy or spina bifida may cause flat feet issues as well. Another cause of flat feet may be caused by tarsal coalition wherein the foot bones connect in an unusual way. People are also much more likely to develop flat feet if they are overweight, obese, diabetic, or pregnant. It may also be caused as people develop, age or following pregnancy. Athletes may also develop the condition due to past injuries. Oddly enough, some people with flat feet may also never experience any problems or pain. Flat feet only require attention and treatment if they are causing you discomfort, restricting movement, or indicating another underlying condition. If you are dealing with flat feet, then the good news is that flat feet are fairly common. Flat feet treatments exist to help relieve discomfort and correct any issues they may be causing. In some cases, supportive shoes, fitted insoles, wedge supports, or arch supports (AKA orthotics) may be enough to relieve pain and strain on the feet. If flat feet are due to obesity, then weight loss may help improve symptoms of pain and inflammation. For those who feel that their flat feet condition is more severe, severely restricting movement and causing intense pain, flat foot surgery and physical therapy may be the best option. If you are looking to correct your flat feet and gain relief from foot discomfort, contact the expert doctors at Jamfeet for a consultation today. Comprising the top podiatrist in Los Angeles, our expert team at Jamfeet work tirelessly to give the greatest attention and care to patients suffering from foot and ankle conditions. Utilizing our years of education, training, and experience, we effortlessly complete different foot and ankle treatments.